לסובפלים מספר אתרי ייצור אשר שטחם המשותף עולה על 15,000 מטר מרובע. שרשרת ייצור מלאה משלב חומרי הגלם ועד למוצר סופי מבטיחה בקרת איכות מלאה על כל שלב בייצור. 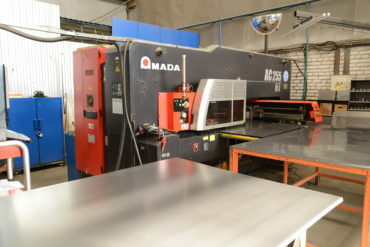 Today, SovPlym production uses AMADA machines for processing of sheet metal. AMADA brand is well-recognised as one of the world leaders in production of specialized equipment for sheet metal fabrication.Laser cutting machines of SovPlym production allows to cut down parts from metal sheets with thickness of up 10 mm with ± 0,1 mm accuracy. Quality of SovPlym laser cutting allows to receive parts with high surface quality, that reduces necessity in additional surface treatment.Coordinate turntable press of the new generation is used by SovPlym production as an alternatve to laser technology. With the same high level of quality it allows shaping the parts with large number of holes directly from metal sheet, therefore significantly reducing production cycle and time that is needed for operation.For metal cutting and bending SovPlym uses high-precision guillotine and band saws supplied by Belgian company IRLEN. 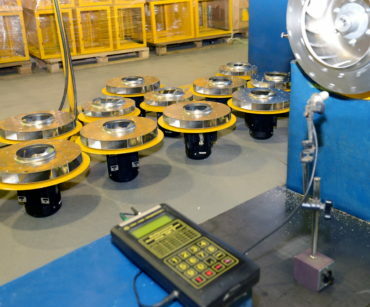 High quality of the production equipment and qualification of workers allow to receive almost finished parts right from machine without need for further additional treatments, that ensures high speed and quality of part production, as well as production rate sufficient to cover the requirements of SovPlym production and fulfill orders from third parties. For welding processes and applications SovPlym uses equipment of Air Liquide Welding and WECO companies with high-quality consumables produced in European countries. For painting processes three semi-automatic powder coating lines that use paints from DUPONT and Tecnos companies, providing reliable wear resistant polymeric coating and good appearance of products. The spraying is done by tribostatic method that, unlike electrostatic, provides the highest quality of surface treatment and powder coating of parts. Assembly process of end products is organized with utilization of intermediate warehouse nodes that ensures uninterrupted supply of assembly kits available to production teams. Such organization of assembly line gurantees fast movement of products and efficient use of working time and warehouse space. SovPlym production is based on the international standards of quality management system and is certified according to ISO 9001/2000. All products and parts produced by SovPlym pass strict quality control performed by internal Quality Control Department. Besides controlling the quality of its own products, SovPlym Quality Department checks and inspects all purchased materials and parts and imported products. For each of produced fan, the dynamic balancing procedure is done on a special stand that allowing to determine exact fan characteristics and adjust it to the best possible performance.